In a kadhai,add 2 tbsp of water and jaggery.Boil until the jaggery melts. 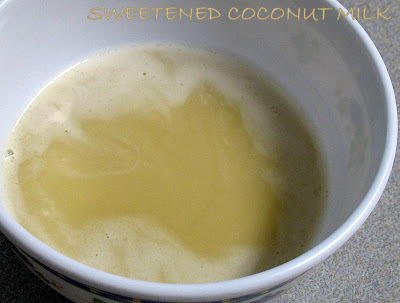 Drain the jaggery solution and add to the coconut milk. Heat the coconut jaggery solution for few secs on lowest temp. Donot boil else the milk will curdle. Serve warm with idiyappam or appam. A very refreshing drink! Love the sweetness! Absolutely delectable ~ loved this sweet version!